You need some easy dinner ideas for your kids. Maybe youre going to go shopping, or youre going to be getting home late from work, or your having a date night. Whatever the case your kids still have to eat! Well, let your worries subside, because here are 25 easy dinner ideas that your kids can make all by themselves! A few of these ideas are crockpot meals for when you are planning ahead. And, if they have a sitter, it will make the sitters life so much easier to already have a simple and easy dinner picked out and have the kids able to put it together. What Makes These Easy Dinner Ideas "Easy"? What makes these easy dinner ideas easy?! 1. Fast  these dinners are quick to put together, most of them can be ready in about 10 minutes! 3. 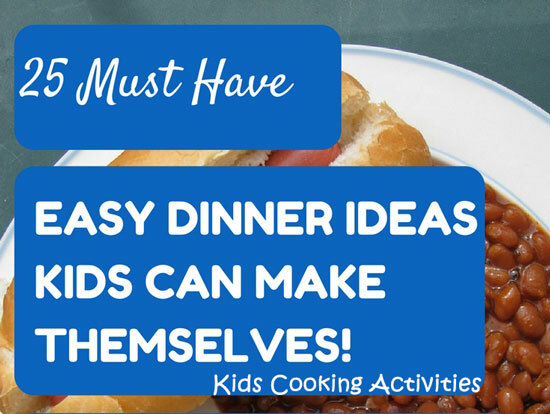 Fun  the easy dinner ideas on this list are fun for kids to make because they are really comfort foods! Every child loves it when their favorite meal is up for dinner. This helps get them excited about actually making the meal and in turn this makes the dinner easy! 4. Minimal Cleanup  making sure that there are few dishes that have to be washed is a MUST when kids are in charge of making the meal! My 25 dinner ideas require very few dishes, at most about two pots. Every dinner on my list of 25 dinners has the above characteristics. They are all fast, simple, fun and have minimal cleanup. These characteristics are definitely what defines them to be easy dinner ideas! 1. Grilled Cheese and Tomato Soup - Preheat a pan on the stove or a griddle. Butter 2 slices of bread, get out 1 slice of cheese. Put 1st piece of bread (butter side down) in pan, then a piece of cheese, then 2nd slice of bread, butter side up. Heat up 1 can tomato soup according to directions on the can. 2. Bean Burritos - heat up 1 can of refried beans according to the directions on the can. Spread on a tortilla. Top with Cheese. Roll Burrito up. Serve with a Yogurt Salad - pour 1 container of yogurt into a mixing bowl. Drain 1 can of fruit cocktail. Add the fruit cocktail to the yogurt and mix. 3.Cheese Crisp - Preheat oven to 400. Lay 1 flour tortilla out on a cookie sheet. Spread shredded cheese over it. Bake for 10 min. 4. Hot Dogs - heat according to package directions. Put in Hot Dog Bun. Serve with Chips and baked beans. 6. Macaroni and Cheese + Lemon Poppy seed Muffins - Macaroni and Cheese - follow directions according to the box. Lemon Poppy seed Muffins - get the box mix that just calls for milk. Very easy to just follow directions then. 7. Tuna Sandwich + Cottage Cheese + Cucumber Slices- Tuna Sandwich - open 1 can of tuna and drain well. Add about 1 Tablespoon of Mayonnaise and a small amount of pickle relish. Mix together. Spoon onto sandwich bread. Serve with a scoop of cottage cheese on the side and cucumber slices. 8. Pizza Toast- Add a slice of bread, half a bagel or English muffin halves onto a cookie sheet. Spread tomato sauce on a slice of bread. Add a dash of oregano. Sprinkle top with cheese. Bake in a 400 degree oven for 3-5 minutes until browned as you like. directions. In a second saucepan, heat up 1 jar of spaghetti sauce. After the noodles are cooked, top them with the heated spaghetti sauce and some Parmesan cheese. Serve with bread and butter. about 6 hours on high. Remove chicken from crockpot and drain out any water. Put chicken back in crockpot and pour BBQ sauce over the chicken. Heat chicken with BBQ sauce about 30 minutes in crockpot. Serve with rolls. 12. Chicken Noodle Soup + Rolls-Chicken Noodle Soup - follow directions on the can. Serve with rolls or bread slice. 13. English Muffin Pizzas - cut 1 English Muffin in half. Toast in the toaster. Put on a plate and top with spaghetti sauce and cheese. Then heat in the microwave for about 45 seconds or until cheese melts. 14. Nachos + Beans + Salsa- For nachos spread tortilla chips on a plate. Top with shredded cheese and black beans and a little bit of salsa. Heat in microwave until cheese melts. cream of mushroom soup. Cook about 6-8 hours on high. 18. Fish Sticks + Applesauce - follow the fish stick directions on the package. Serve with a side of ketchup. Add peas and applesauce for sides. 19. Corn Dogs + Potato Chips + Baked Beans - Cook Corn Dogs by following the directions on the package. Serve with a side of ketchup and mustard. For Baked Beans, heat on the stovetop or in the microwave according to the directions on the can. 20. Baked Potato + Chili Beans - Wash and scrub outside of potato. Poke with a fork several times on all sides of the potato. Cook potatoes in the microwave, using your potato button on the microwave. Otherwise, cook the potato for 4-5 minutes. Heat some chili beans on the stovetop and spoon these over your cooked potato. Serve with a vegetable, such as carrot sticks or broccoli spears. 21. Crockpot Chicken Tacos-Put 4 chicken breasts in the crockpot, pour 1 package of taco seasoning over the chicken. Put 2 cups of salsa over the chicken. Cook for about 6-8 hours. When it is cooked, shred it with a fork and a knife. Then put the chicken in a taco shell. 22. Fish Sandwich - bake the fish fillets according to the package directions. Spread Mayonnaise on both sides of a hamburger bun. Then, put the fish patties on a hamburger bun. Top with a slice of cheese. taco seasoning package to add any other ingredients. Heat through. Serve meat in taco shells with cheese sprinkled on top. 24. Sloppy Joes and Chips- Sloppy Joes - brown 1 lb. of ground meat in a saucepan. Drain any fat that may be in the pan. Add 1 can of sloppy joe sauce to the meat. Follow the directions on the can. deli ham into the eggs. Sprinkle some cheese over the eggs. Cook the eggs over a medium-low heat.